Just after 4am an extensive north-south line of thunderstorm activity spread in the from the west. It brought some close CGs and 20mm of rain in about 15 minutes. 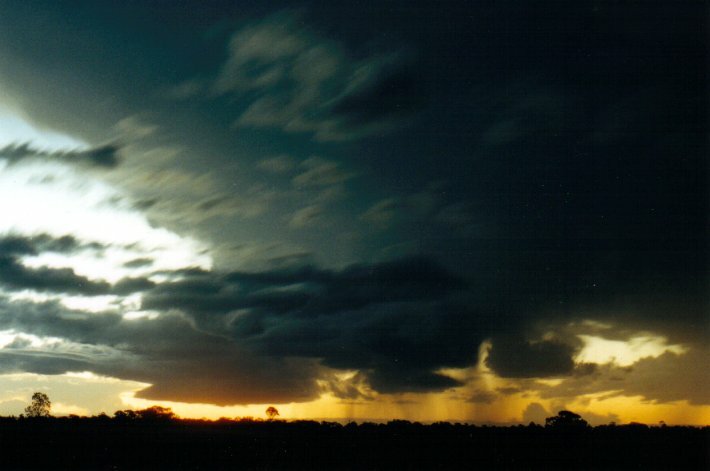 The evening before had also seen some thunderstorms in the Northern Rivers district with reports of strong winds and very heavy rain in parts. Sunday was mostly fine with light SW winds and scattered cumulus. The SW winds were not a promising sign for storms despite the forecast and an approaching very cold pool from the south. There was however hints of a moisture haze. 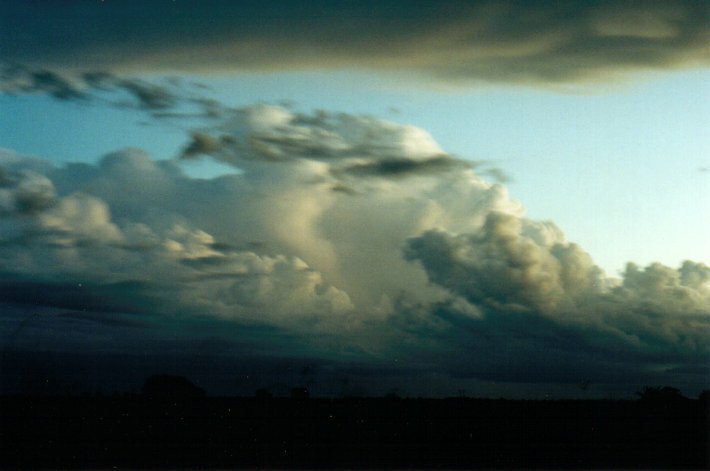 During the early afternoon some cumulus congestus formed in the region. 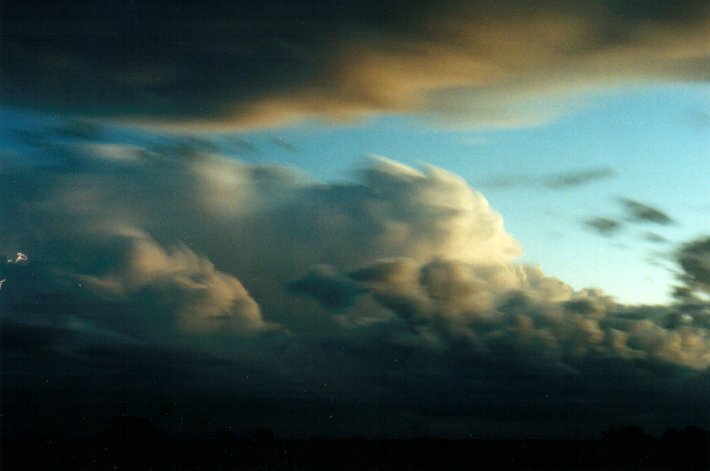 These were not particularly strong and lacked any signs of strong updrafts. Some persisted and developed weak looking anvils facing in a southeasterly direction while the cells propagated towards the northeast. 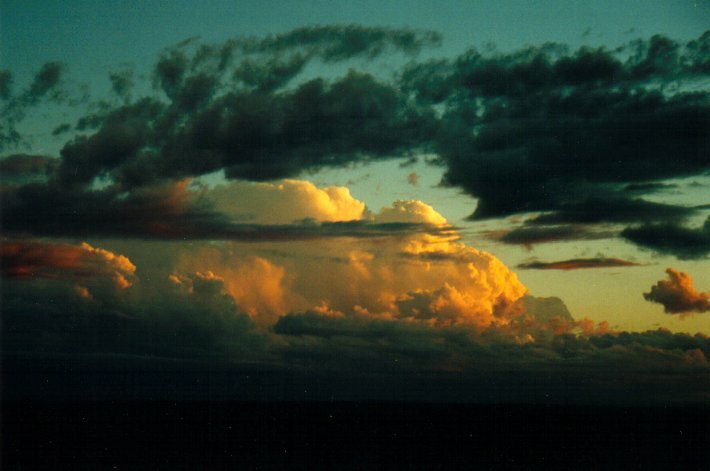 Cloud tops were at most 8km (25,000 feet). By around 3.30pm I had sort of given up on the possibility of storms but remained online checking the radar occasionally. 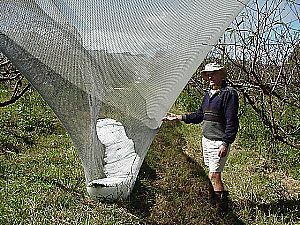 It was showing the usual activity between Dorrigo and Grafton on the ranges. I hadn't checked the net for a while so at 4.30pm I was shocked to see a severe thunderstorm advice out for Northern Rivers and the cells near and north of Grafton looking more organised on radar. I could just make out the tops of the nearest cell from my home at McLeans Ridges and it still looked weakish, but was gaining fantastic contrast with the sun getting pretty low in the west. The chase was on. I headed to the first haunt at Parrots Nest south of Lismore arriving there just after 5pm. On the way a fairly decent looking cell to the southwest was gaining beautiful colours from the sun, while another developing complex was gathering strength just northwest of Casino and to my west. It seemed to have a good inflow region at the base - actually two separate bases, one on the north and another on the southern edge. Radar clearly shows two cells developed right next to each other and splitting, with the northern one heading northeast and the southern heading southeast ! I moved on to another favourite spot in Fig Tree Lane, about 10km east of Casino. At 5.20pm the dominant storm to the SW had developed a little and continued to display lovely sunset colours with the odd CG and in-cloud lightning strokes, while the one to the west was very obviously splitting apart. 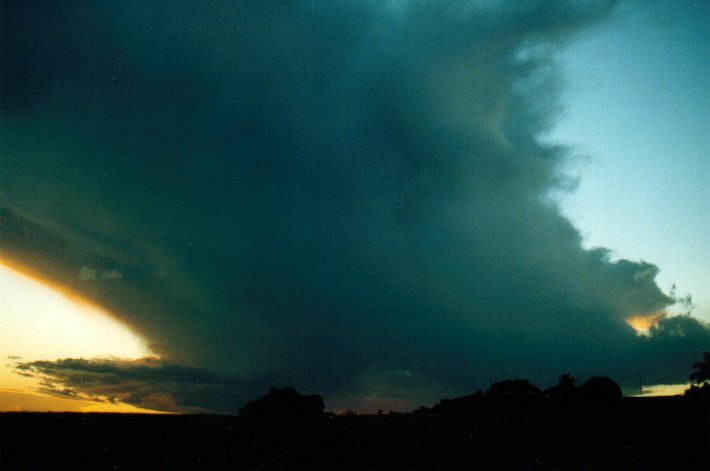 The southern and closest cell exhibited a lovely lowered base like a wall cloud and small scuds were observed beneath that. At the time I thought the cell was too small to produce anything significant, but this feature persisted for ages while the whole structure intensified. 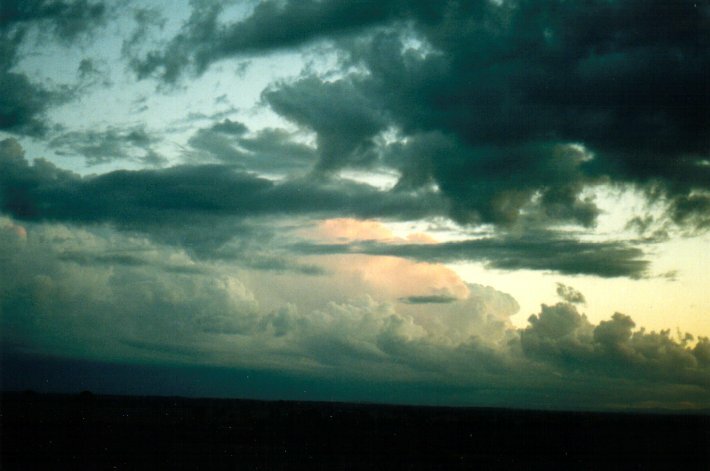 There was a clearer area in the base, to the right of the lowering, then the second base of the northern cell. 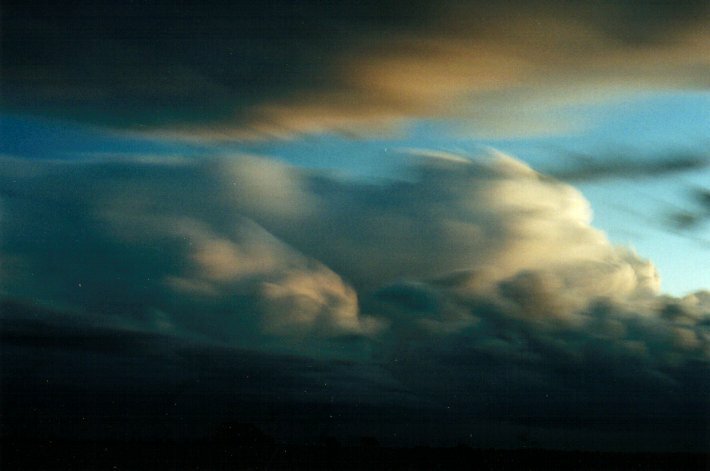 The anvil spread over the top of my location towards the southeast and was quite thick with some mamatus. The southern (right moving) cell gave off the odd CG but the northern one seemed much more active. As the larger thunderstorm from the southwest approached I guess it swallowed up the right moving splitter. It was becoming dark and hard to make out features. I kept taking lightning photographs until complete darkness but was not successful due to the infrequent bolts always occurring out of frame. The main storm was only a few kilometres away to my SSW by 6.20pm and giving off quite a lot of lightning but almost all of it was in-cloud. It was soon apparent the centre of action would move just to my east and seemed to be tracking towards Lismore. Brief strong and quite cold outflow wind hit at 6.30pm following by some busts of heavy rain. 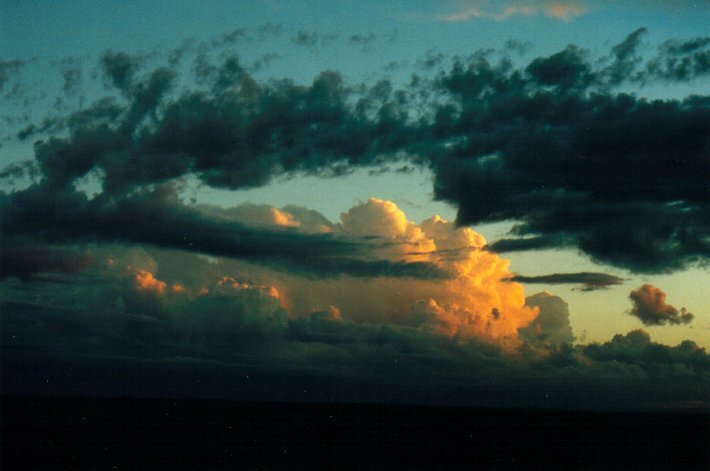 There had been no inflow winds, in fact it had been calm. I decided it would be best (and more fun) to try and stay in the heavy rain by heading east on the Bruxner Highway back towards Lismore then home. But the rain didn't last long and it seemed the cell was much further east than I thought. Radar shows the cell had started to head more towards the ENE than the NE earlier. 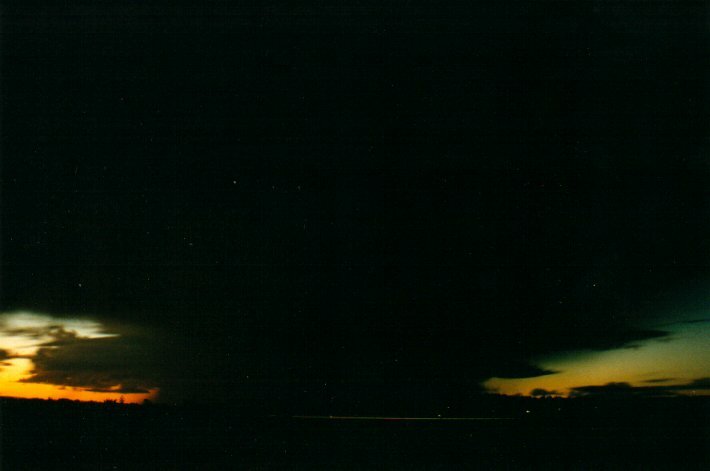 By the time I reached Lismore the lightning was very active to the ESE but I couldn't make out any features. I kept heading east along the Bruxner Highway while lightning was almost constant now. 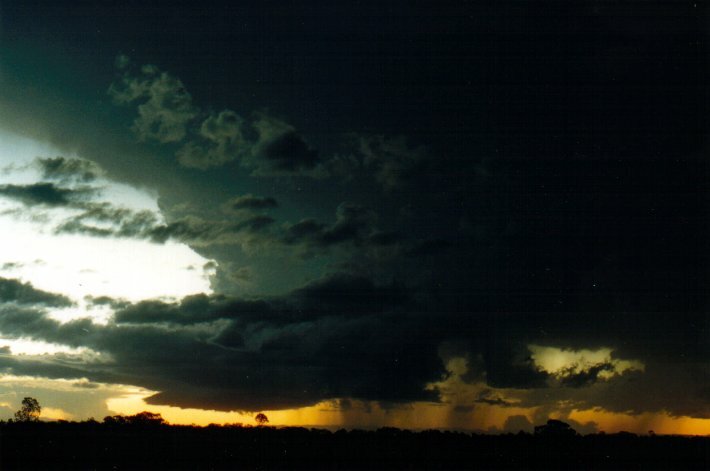 A few spits of rain fell in Goonellabah but the cell still appeared to be about five kilometres to the east. At the Alphadale intersection strong winds commenced and some rain. 1km further east and the rain became torrential and hail starting smashing all around. It was extremely difficult to see the road and I just had to get the video camera out for this, so I ducked briefly into McLeans Ridges Road. I quickly decided to head further east and edged up to Wollongbar outside the TAFE. The weather was berserk here! The time was about 7.15pm. I found a great spot under some big streetlights and videoed the action. 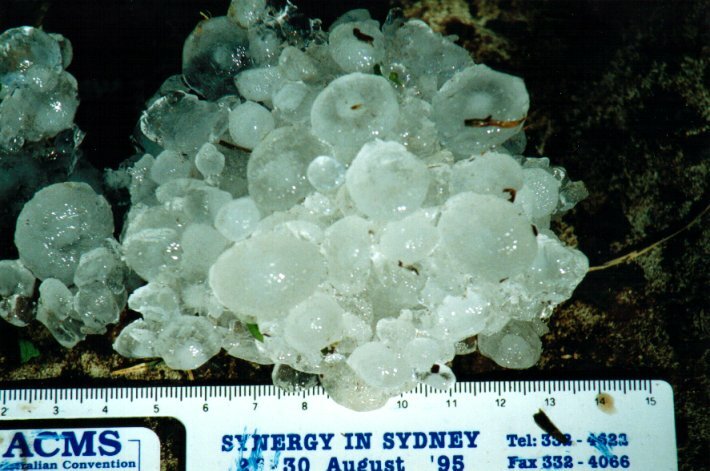 The amount of hail and heavy rain falling was phenomenal, stones up to 2.5cm diameter but mostly 1-1.5cm struck all around, driven at first with some fairly decent S winds. The odd flang was only just observed through all the noise and hail. The road soon took on a rather white appearance with the few cars still venturing through making tracks through the hail. As the wind eased but with the hail still ferocious, I moved a bit further east to find any hail drifts on the lawns of Wollongbar homes. A car was off the road in a ditch at the corner, and the BP service station at the corner of Rifle Range Road had lost its roof, but I didn't notice that while driving past because of all the precipitation. It seems an isolated gust around the 50-60 knot mark pushed in roller doors to the workshop and lifted the entire metal roof and I-beam over the property immediately north of it and into two-story flats 25 metres away. It caused considerable damage. 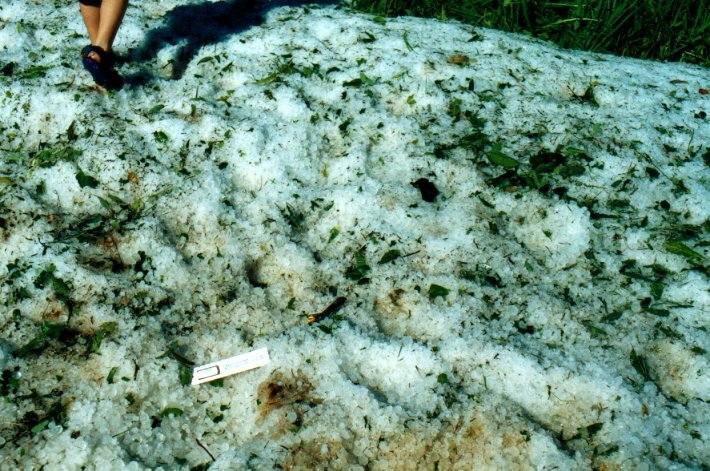 Hail had piled up on lawns and it was great to finally see drifts of hail, an event I'd not previously witnessed before. The storm weakened quickly as it tracked out to sea between Ballina and Byron Bay. 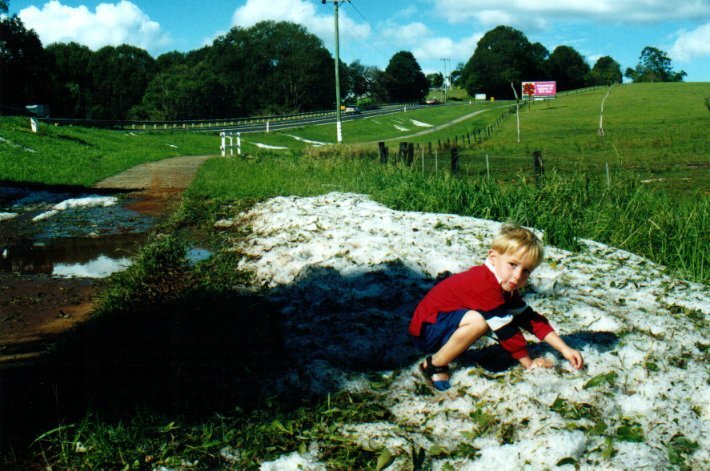 The next morning I received reports of hail drifts like snow beside the Bruxner Highway at Wollongbar, but was unable to check it out until 1pm because of work. 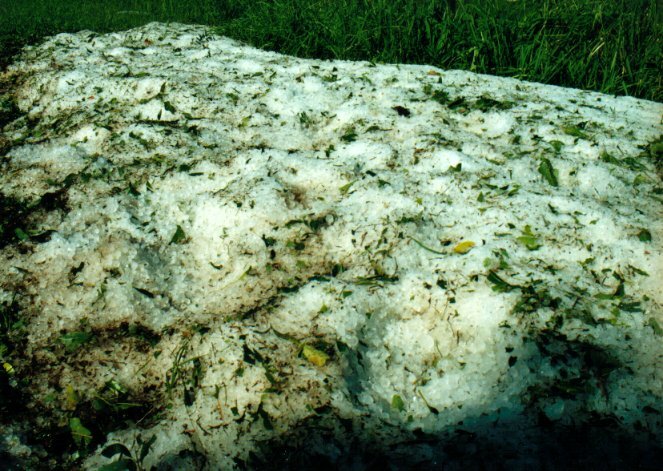 I was amazed to find piles of hail up to 30cm deep next to a culvert and on a footpath area next to the road. And it did look like snow patches against the green grass! My son and I had fun with this for about 30 minutes measuring the size that was up to 2.5cm diameter, and generally freezing our feet, before heading off to see where else hail drifts hadn't melted already. 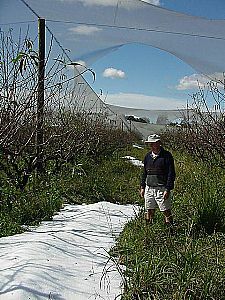 At Lindendale southwest of Wollongbar patches of hail were also found. Also quite obvious in the Wollongbar area was that the trees were almost completely stripped of leaves on their southern sides. 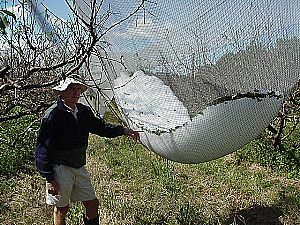 These next four photos were taken by Renee Du Preez, ABC North Coast rural reporter at Lindendale. Used with permission. 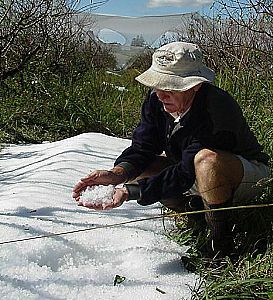 Weather enthusiast Steve Cselka who lives at Ellangowan (16km SSE of Casino) reported hail the size of 10 cent pieces covered his property after the storm hit from 6.10pm. It was accompanied by torrential rain but no wind. If you have any photos of the hail please email me. 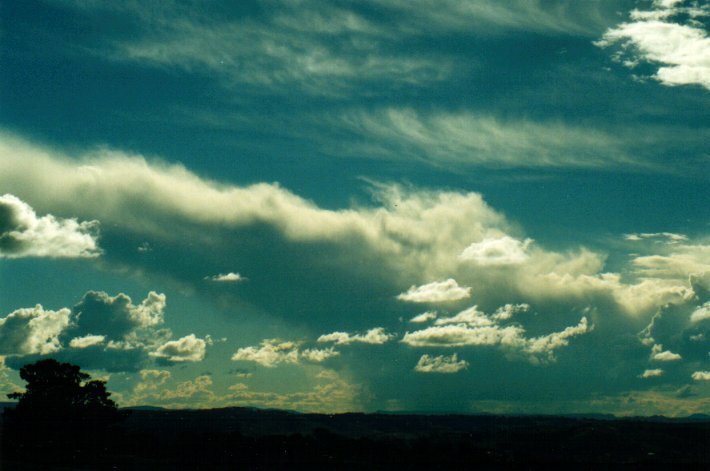 It was interesting on the Friday that the BoM had forecast an upper trough to develop over NSW and produce storms, rain and strong winds. During the week there seemed to be a fair bit of shower activity off the coast and even storm activity especially in the morning. On the Saturday I thought we might have a wet day according to the forecast but there was still blue skies and those cells off the coast. I went to Evans head for a few hours on Saturday night and on going down there before dark I noticed some build up to the south. I was indoors for some time and was unable to check out what was going on but I did hear thunder and some said they saw lightning. On coming home we passed through a storm and on going through the Evans Head township there was a bright flash of lightning and then the street lights went out. This was around 10:00pm. We drove through heavy rain and wind and there was evidence of branches broken as we headed towards Alstonville. The lightning seemed to be more concentrated to the east and the sky was darkest there. Heading towards Alstonville the rain had eased so we must have passed through much of the storm. Early on the Sunday morning there was another storm which seemed to come in from the south west. 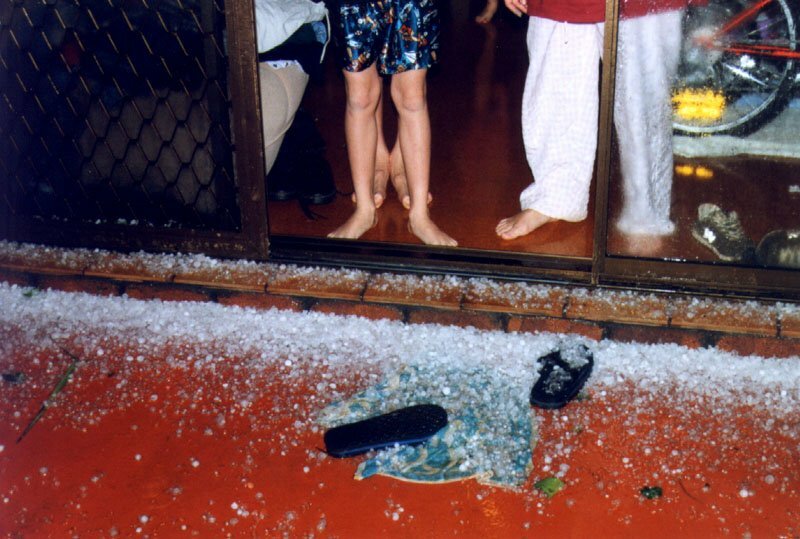 There was of course the event that occurred on Sunday night for you will already know of the damage that occurred in Wollongbar as the severe hail storm wreaked havoc. 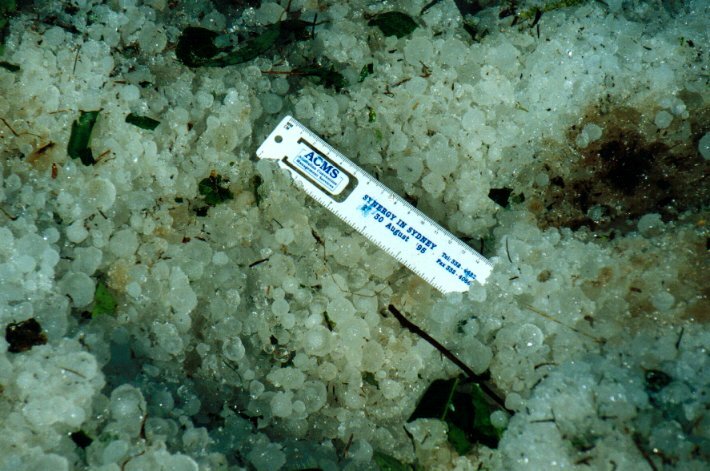 However where I am just east of Alstonville we didn't get as much of the hail as some areas did. It would seem that the storm cut a narrow path. Sunday looked very much like Saturday with similar cloud formation. During the afternoon some cells to the west started to develop. One such cell to the north west had it's top broken off and cirrus scattered further east however I noticed flanking lines to the distant north and some lightning later. A cell that was more to the west was more developed this was around 5pm and within the hour there was lightning and distant thunder coming from this one. As this fanned out further and moved to the north another cell to the south west with regular lightning which could be seen at the top of the cloud was the prize winner as it moved closer and didn't look like weakening. About 10 minutes before the storm hit I watched it from outside with the moon glowing the thinner cloud overhead it was obvious how dark the cloud to the south west was. I could just see the shelf cloud which had a defined rounded edge to it. I could see the underside of the cloud with its rain band when it was lit up by the lightning. This looked interesting. The wind started to freshen from the west and it was a bit cold. Time to go inside. Not long after hail pounded everywhere, there was a blackout for about 20 seconds. The hail was the size of small peas and only lasted for about two minutes and then came the heavy rain and wind. It didn't seem to last all that long and soon it was moving away to the east. So we didn't get it as bad as some areas. To me not worth reporting to the BOM from my location. We had 7mm from it and at work at Summerland House in Wardell Road they had 14mm. 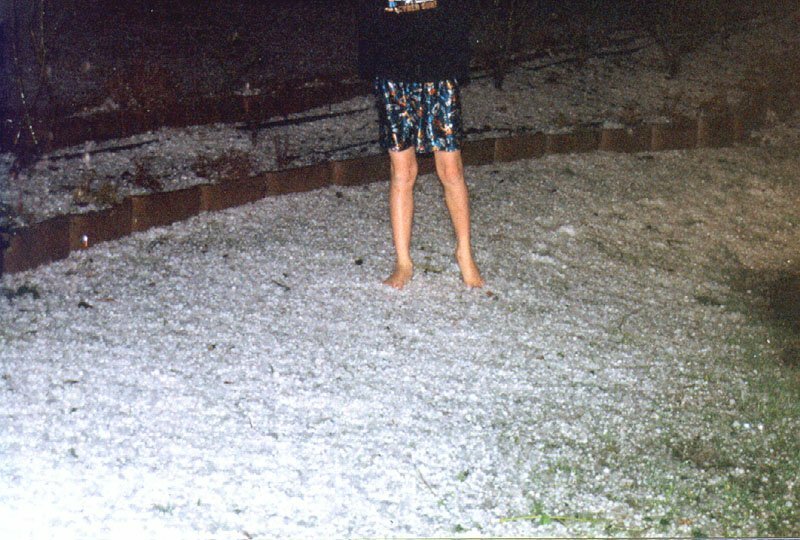 Some people say that it is unusual to get hail after dark. My only answer to this is that the atmosphere must have been cold enough at the lower levels. After the storm I checked the lightning tracker and radar and you could see the action off the coast.